Robert Lee Aston has degrees in mining engineering and geological engineering from Missouri S&T and a law degree from Aston University in the United Kingdom. He is also a World War II Air Force combat veteran. 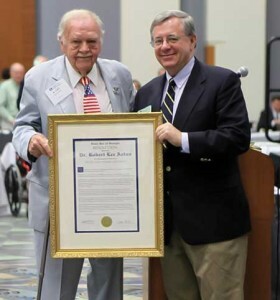 In June, Aston, Min’50, MS GeoE’92, DE MinE’00, received a special award from the Georgia State Bar for doing pro bono work for heroic veterans. So far, more than 100 medals that were never received have been obtained, thanks to Aston’s work.